Are cupcakes still a thing? Of course they are, especially during summer. I admit that mine do not look perfectly elegant and that is because I overfilled the tins out of lazyness. (And yeah, my piping skills could be better.) I had pulled a muffin pan for six muffins out of my huge collection of baking pans and didn’t want to go looking for a second one. If I had, I probably would have gotten eight servings out of this recipe. But if there can be jumbo muffins there can also be jumbo cupcakes, right? And I tried very hard to replace some elegance by adding meringues to these treats. Vegan meringues. I know, you’ve all heard the story by now. But probably not your non-vegan friends and aquaintances. 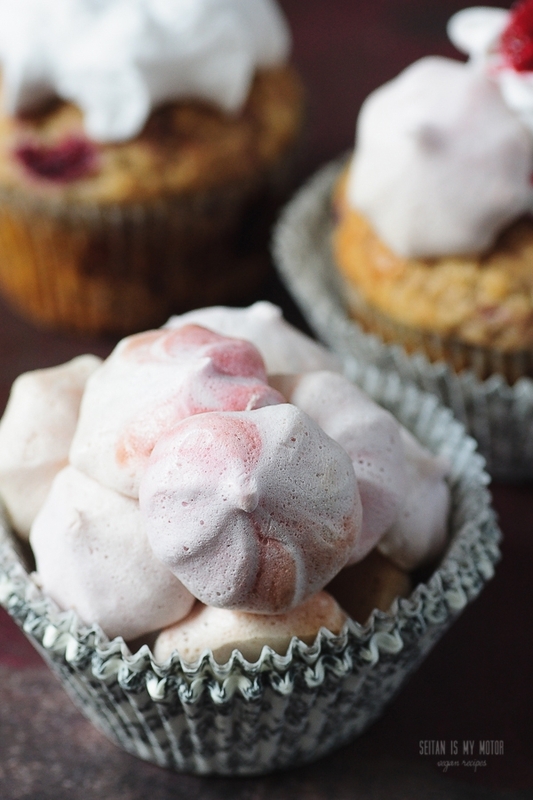 Serve these raspberry flavoured meringues to everybody who’s going to tell you how vegans have to make so many food sacrifices. The meringue recipe is based on my vegan marshmallow fluff. But the idea to make meringues is one I got from révolution végétale and the vegan meringue facebook group. It’s best to prepare the meringues a day in advance for better time management. Keep them stored in an airtight container. They get sticky fast once they are exposed to air. 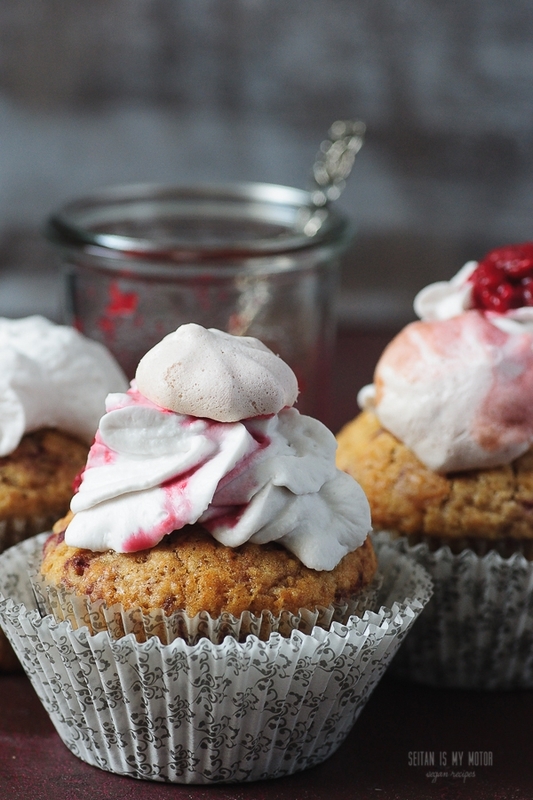 The topping for these cupcakes is a whipped coconut cream topping. So while you are making the meringues, place a can of coconut milk in the fridge. To make the cooked rasberries, place berries in a small saucepan and bring to a boil. Reserve both the fruit and juice and store in the fridge. To make the meringues, preheat the oven to 100°C (212°F). Line two baking sheets with parchment paper. In a large bowl, combine chickpea brine and guar or xanthan gum. Whip for two minutes using a handheld mixer. Add sugar and raspberry juice and whip until very stiff. The fluff should keep its form so you can pipe it easily. This may take up to 10 minutes. Fill the fluff into a pastry bag with a star tip and pipe about 2 cm (1 inch) large (or larger) meringues onto the sheet. They won't spread so you can put them relatively close together. Bake 1 sheet at a time for 1 1/4 to 1 1/2 hours. Baking time can vary a lot, start checking on your meringues after 1 hour. If you went for larger meringues they might take up to 2 hours. They are done when completely dry. Make sure they don't start to brown. To make the cupcakes, preheat oven to 180°C (350°F) and line 6 muffin tins with liners. Combine flour, shredded coconut, baking powder and salt in a large bowl. Combine sugar, coconut milk, and oil in a second bowl and whisk to combine. Add to the dry ingredients and mix until all lumps are gone. Fold in cooked raspberries and fill into muffin tins. Bake for 30 minutes or until an inserted toothpick comes out clean. To make the topping, scoop out the coconut cream that has solidified at the top of the can and place it in a bowl. Add powdered sugar and whip on high spead until fluffy, for about three minutes. Place the coconut cream in a piping bag with a star tip and pipe onto your cupcakes. 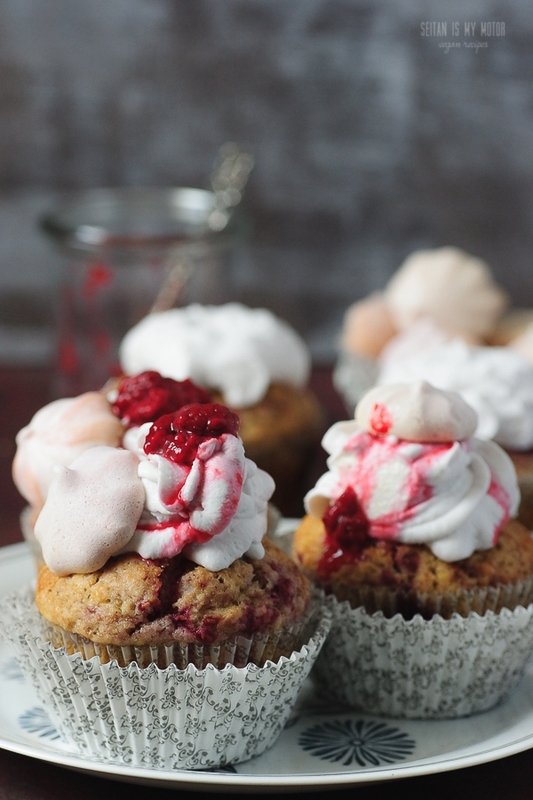 Decorate with cooked raspberries and meringues. *You can also use the liquid from your chilled can of coconut milk: Scoop out the coconut cream and place it back in the fridge. Then measure out 1/2 cup of the clear liquid and use insteead of coconut milk. **Place a 400 ml (14 oz) can of coconut milk in the fridge. Chill it for at least 8 hours, preferably more. Zum reinlegen! Hab nur die Muffins gemacht, aber mit Blaubeeren. Das ist das erste Rezept, was fantastisch in meinem Ofen mit Gas Unterhitze geklappt hat. Sie waren sogar braun und knusprig oben drauf und Innen saftig. Ich habe schnell die Hälfte eingefroren, damit ich sie nicht alle sofort aufesse! Vielen Dank für das super Rezept! Das ist ja toll! Das mit dem Gas ist gut zu wissen. Danke, Lisa! I’m finally going to have time to whip up your recipes (aquafaba-related and not) in my kitchen in the coming months, I’m so stoked! I’m stoked you have more time! These look pretty elegant to me! I think they would look even more elegant if I was moving one towards my face to eat it!